"Just like the appetizer at Bonefish Grill®!" Whisk mayonnaise, sweet chile sauce, and Sriracha hot sauce together in a bowl. Place cornstarch in a shallow bowl. Gently press shrimps into cornstarch to coat; shake off any excess. Working in batches, cook the shrimp until they are lightly browned on the outside and the meat is no longer transparent in the center, about 3 to 5 minutes. Transfer to paper towels to drain. Put cooked shrimp in a bowl and pour chile sauce mixture over the shrimp. Toss gently to coat. Line a serving bowl with lettuce leaves. Pour shrimp into bowl and top with green onion. 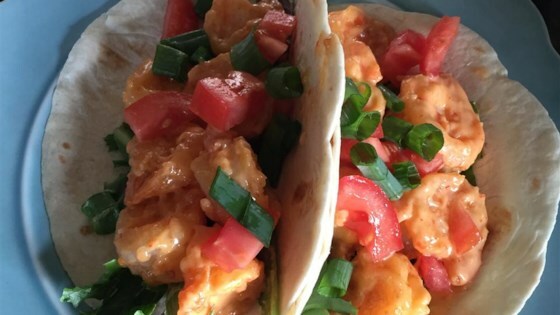 Add tempting cereal crunch to your shrimp! I left sauce on the side, great idea. Everyone said they tasted perfect. Mine didn't taste exactly like Bonefish. Probably because I used an oriental chili garlic sauce rather than Sriracha. But it turned out fabulous all the same. Two thumbs up.